Though they have lost a little popularity since the rise of the multiplayer online first-person shooter, fighting games have long been one of the most popular genres out there. Fighting games have evolved over the years to appeal to new audiences and try to keep a relatively standard form of play fresh and exciting. As more and more people get away from handheld consoles like the Gameboy, they rely on their smartphones for mobile gaming. This has led to the release of a handful of entertaining fighting games for the iPhone, but not all of these games are created equally. I have taken the liberty of ranking these games from first to worst so you can jump right into gameplay. It was easy to put Injustice 2 at the top of this list because it is easily the most advanced and visually stunning fighting game on the iPhone to date. 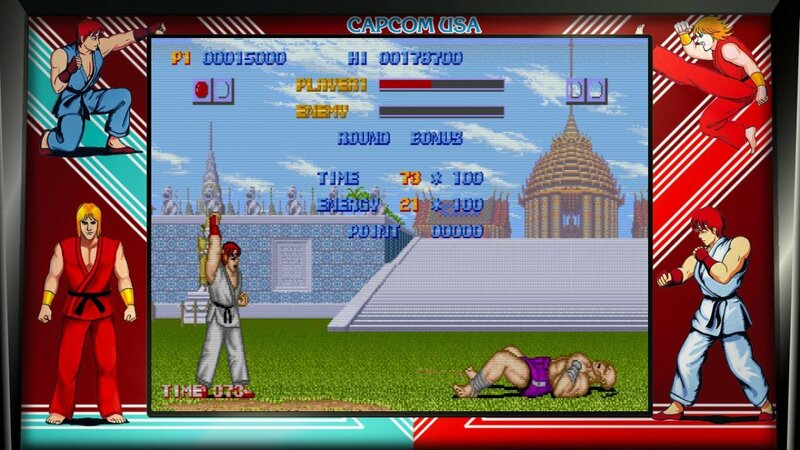 They managed to take the commonplace mobile fighting game concept and give it a fresh twist that didn't seem possible. For those of you who don't know, Injustice is a fighting game that was first released on the big consoles and pits DC Comic's heroes and villains against each other in a fight to the death much like Mortal Kombat or Street Fighter. Injustice is filled with characters from the DC universe good, evil, and obscure. 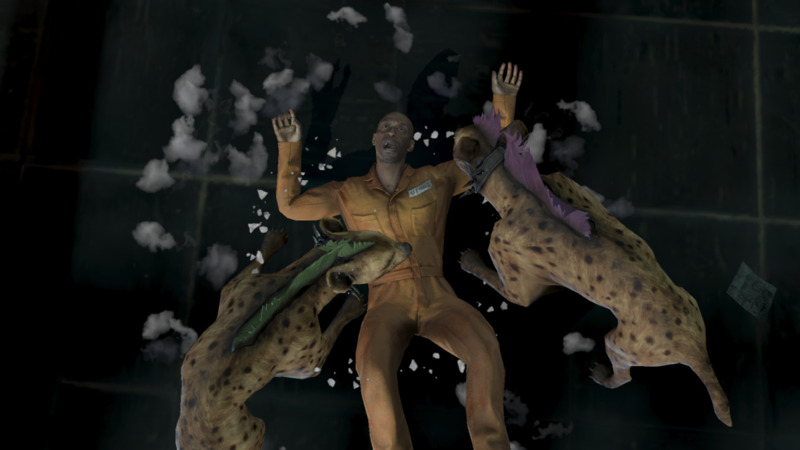 While all of the roles that you play as are recognizable, you will fight against some generic characters like prisoners, thugs, and gorilla soldiers. You start out with three primary DC characters but as you play you earn parts to add new characters to your team, and all of the characters are upgradeable to make even the most basic of heroes or villains into badass fighting machines. What makes the gameplay so innovative? 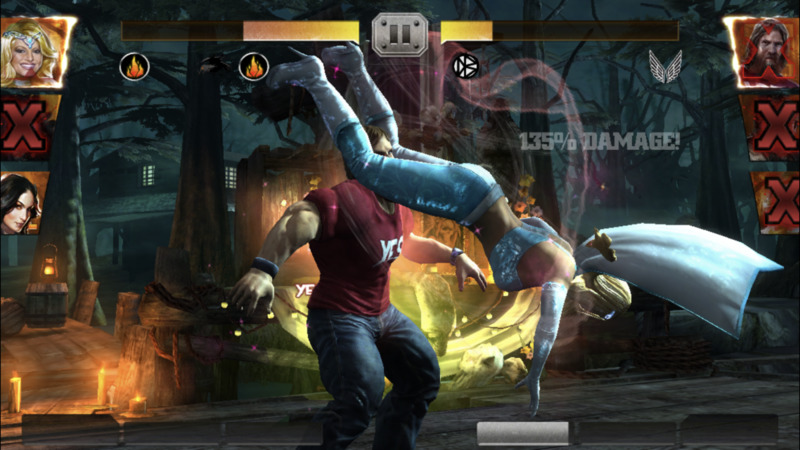 In past fighting games, including the original Injustice, the game mechanics were: tap for a light hit, hold behind your character to block and in front of them for a heavy hit. Of course, you can also build up energy for special attacks. With Injustice 2 they changed a lot of this up. You can still tap to deliver light attacks because there is no way around that, but now heavy hits are done by swiping forward. There is now a dedicated block button so swiping backward allows you to jump back for more maneuverability. I think the best improvement they made, and one of the features that make this the best mobile fighting game there is right now, is that you can jump, and attack while jumping, which gives you better mobility and more attack options. Not to be outdone by other lesser games on this list, Injustice 2 offers more gameplay than just the standard three on three battle mode. There is a fantastic story mode which gives you one on one play along with high definition story videos after each win. It allows you to send members of your team on off-screen operations to gain XP and gear and challenges to win exclusive hero shards and other rewards. There is also a multiplayer arena to test your skills against other players online. All of this together makes this the best fighting game there is on the iOS. 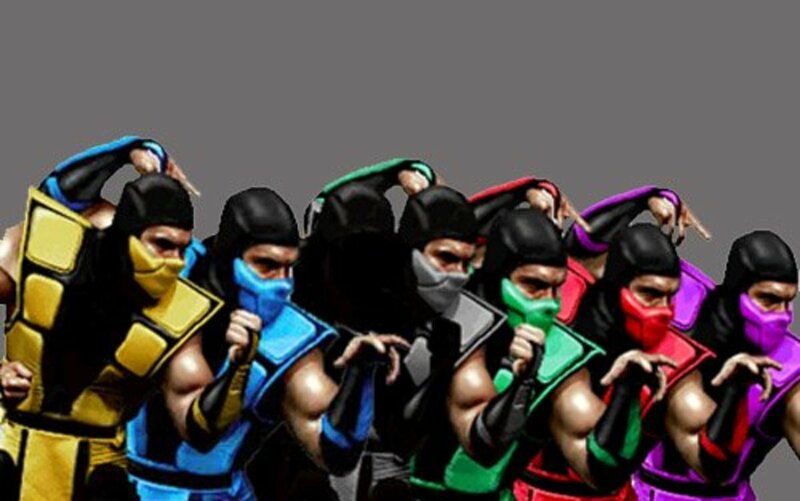 When Mortal Kombat was released in 1992, it changed gaming forever. They may seem a little extreme, but Mortal Kombat paved the way for not only fighting games but all games that incorporate blood and violence. The franchise is still going strong today, and with a lack of sales in handhelds, it only makes sense that Mortal Kombat would move into the mobile realm. They chose to release the mobile version of Mortal Kombat X at the same time they released the console version in 2015, and while the console version will always win out, they did a pretty decent job with the mobile game. 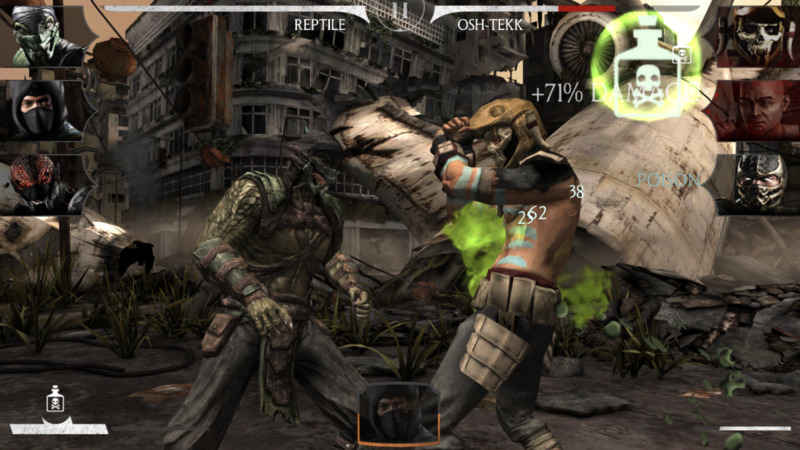 Traditional Mortal Kombat games only give you a set number of characters in the Mortal Kombat Universe, but the mobile version offers a little variety. You start the game with three generic characters including a soldier, a ninja, and another generic fighter. Once you learn the ropes of the game you start to configure your team and add in the characters that you have grown to love along with a few others that are unique to the game. The one problem with any fighting game on a smartphone is that there are not a lot of options when with comes to fighting moves. Mortal Kombat is no different in this aspect as they have lighter attacks that can be combined for a stronger combination attack, but that gets a little repetitive. Every hit you give or take builds up an energy bar that can be used for special attacks, all of which you can activate and upgrade. What sets Mortal Kombat X apart from other fighting games is that you can perform the now iconic fatality after a victory. Tapping the screen repeatedly can get a little old, which is where Mortal Kombat X again sets itself apart from other fighting games. There are a lot of things to do in this game besides fight which adds immensely to the value of the game. You can do things like send your characters on quests to gain experience so you are more managing than playing. There are also a lot of side missions like the relic hunt and Shao Kahn's tower. Mortal Kombat X even offers a multiplayer mode so you can fight against friends online. All of this stacks up to make it one of the best mobile fighting games on the iPhone. If you are looking for a great story mode with one on one fighting this is the game for you. Though there are not a lot of features to this game that is different from any other game, they do manage to do it their way. Plus, you get to control the Marvel stable which is always fun. As far as getting what you want out of the character selection, this game has you covered. Instead of filling their rosters with "inmate number one," you get all Marvel characters all the time. While they do delve a little deep into the library, they also offer characters from different Marvel universes too. I'm only on level six, and I already have Wolverine, Spiderman, Vision, Ultron, and Colossus. The mechanics of this game are pretty cut and dry as far as mobile fighting games go. You can tap for light attacks, hold in front of your character for heavier attacks and hold behind your character to block. Just like other games the hits you give and take build up energy that can be used for a special attack. Though the mechanics of the game are nothing special, the flow of the game is slightly more fluid than other games, so it is easier to put together combos. 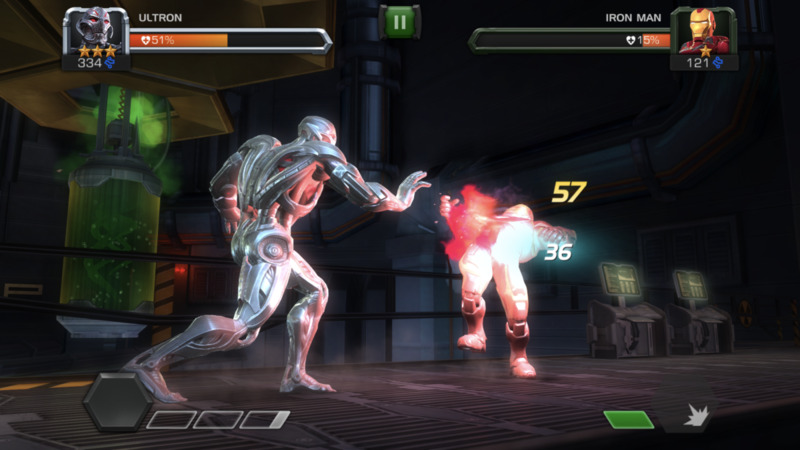 Unlike other mobile fighting games, Contest of Champions keeps the gameplay pure. There are not a lot of other side missions to distract you; it is all about fighting. 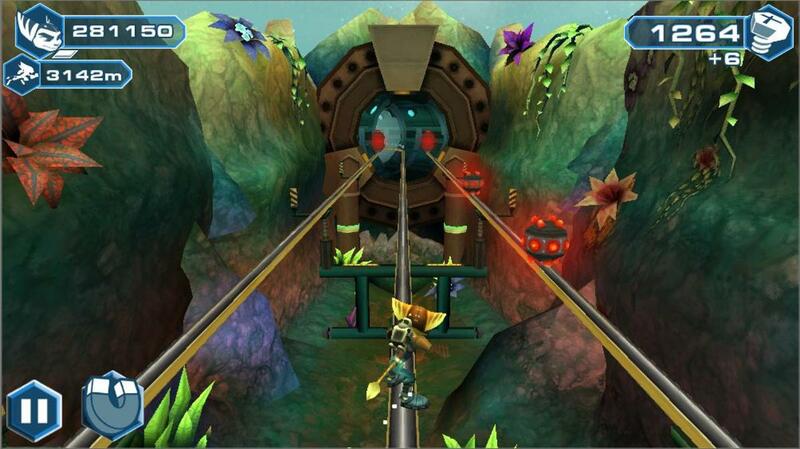 They do have several different modes to freshen it up a bit including story mode, versus, and quests for special items. This may be seen as a con for some people who want to do more than just bash in heads, but it is excellent for those who just want to fight. 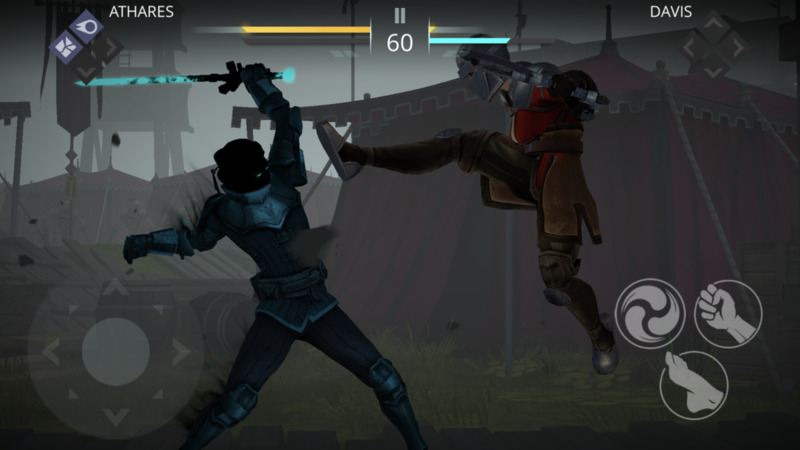 Shadow Fight 3 is probably the fighting game on the iPhone that is closest to a console fighting game. It doesn't have an outside agenda to promote, so it focuses on the game itself. The fact that it is a stand-alone game hurts it in some areas, but I think it makes it a better game overall. Unlike other games, you will not find a stable of recognizable faces here. 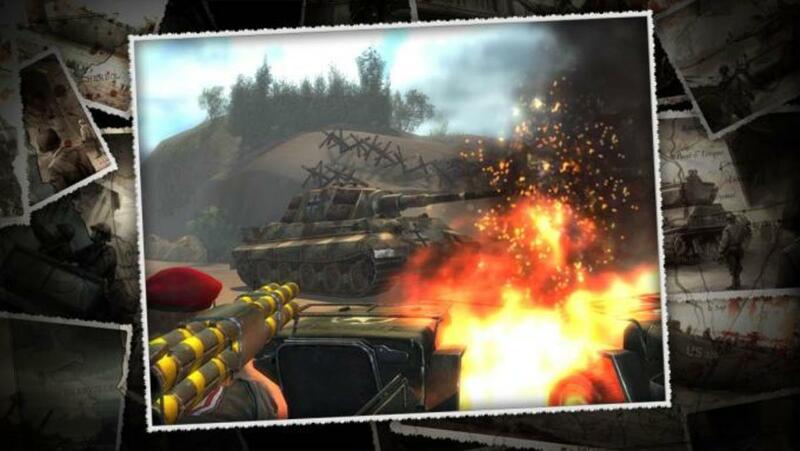 What you do get is a customizable character that you are always changing by adding different weapons and armor. Both the weapons and the armor look cool, though the graphics of this game leave something to be desired compared to the rest of the games. The controls of Shadow Fight are both a blessing and a curse. Having a faux joystick and buttons makes the mechanics feel much like a traditional console fighting game, but it makes it easier to mess up, and I found the controls to be unresponsive at times. Having a more extensive range of motion as well as kick, punch, and special buttons make it easy to throw together combos and allows the fighting to feel more fluid. You won't find a lot of frills here; this game is all about the fight. You have two gameplay options here: the main story and side quests. It's for the best though; I think a game like this one would become too convoluted and lose its edge if they started adding a bunch of unrelated mini-games into the mix. If this game were to beef up its graphics and have a more relatable theme, I think it would have found itself much higher on this list. WWE Immortals reimagines some of your favorite WWE personalities into super humans. Its stable of WWE personalities is probably the strongest thing this game has going for it but that doesn't mean it doesn't have its charms. 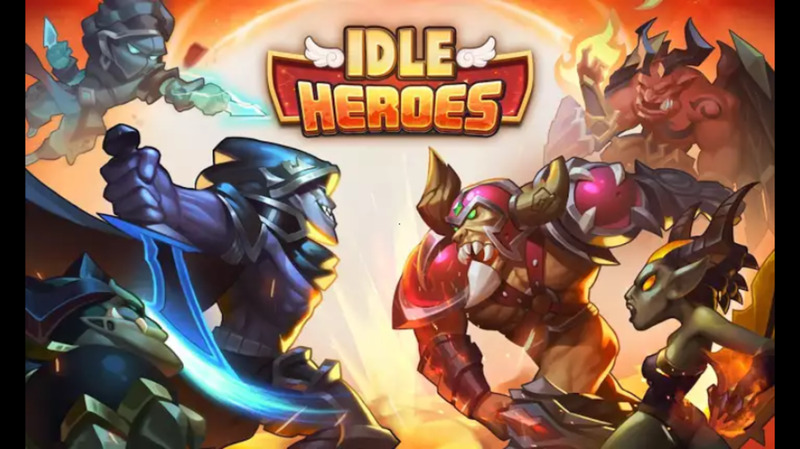 Immortals is an older game, so some of the characters in the game may not be with company any more and you may be missing some of your favorite newcomers but there are plenty of legends that you will recognize. You start with a few lower-rung characters like Nikki Bella and Trish Stratus, but it didn't take long at all for me to add Randy Orton to my team. Characters like Big Show, Kane, HHH, and even Stephanie McMahon are easily within reach. As far as fighting games go this may be the simplest in terms of controls. You tap for light attacks, swipe for heavier attacks, and hold to block. A combo attack allows you to swipe for extra damage and there are, of course, special attacks that you can do as you fill what is called the adrenaline meter in this game. 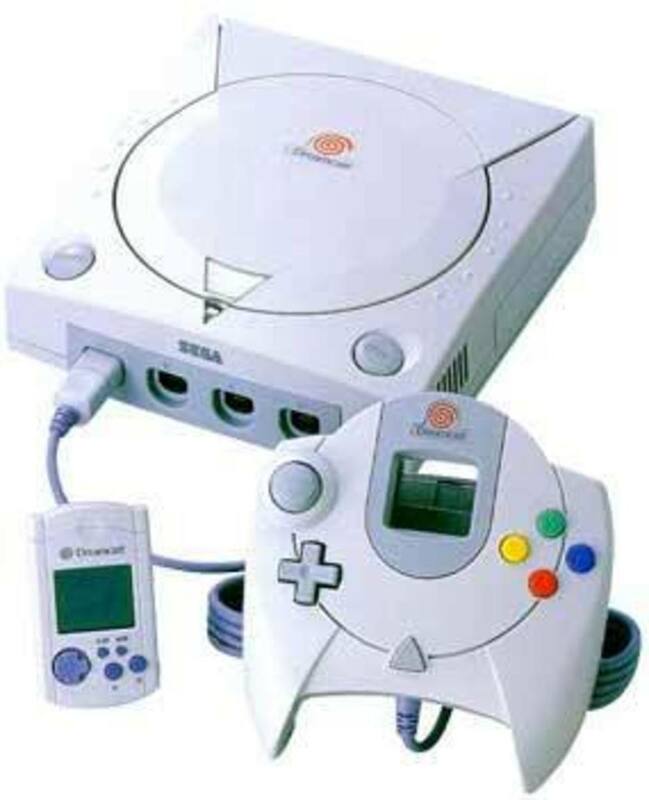 Aside from that there is not a lot of dynamic play when it comes to the controls. One thing that this game does do better than other iOS fighting games in my opinion is giving characters effective and appropriate passive abilities. The game is also really light on anything other than story mode. They offer PvP online matches and a ladder event and that is about it. If you are looking for a complete game that isn't just about bashing brains, you may want to look more toward some of the above games. That being said, if you are a WWE fan you may want to play this game just to control some of your favorite WWE legends. 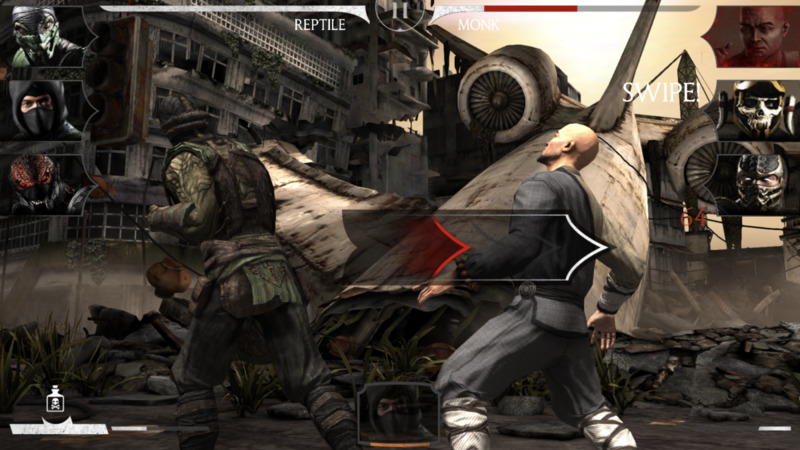 There are a few other fighting games on the iPhone, but these are the top five. A few of these games have predecessors that I chose to leave off of the list because their new incarnations were just better games. All of these games can be found for free in the app store, and while in-app purchases are available, they are not necessary for any of these apps. If you grew up yelling "Get over here!" and "Shoryuken!" you are going to have a great time with these apps.